The Stroke Association is the U.K.’s leading stroke charity. There are more than 100,000 strokes happening in the U.K. each year and over a million people are living with the effects of a stroke. Although stroke is the U.K.’s fourth biggest killer and a leading cause of disability, far too many people still don’t understand it or ever think it’ll happen to them. The Stroke Association strives to build awareness of stroke prevention and stroke warning signs, campaigns for better care and support for the country’s 1.2 million stroke survivors, while raising funds for cutting-edge treatments. As many as 80% of all strokes are thought to be preventable, meaning the greatest hope for diminishing the condition lies with education and awareness. With this in mind, the Stroke Association needed a powerful way to inform mass audiences of the prevalence and risk of stroke with a campaign that would raise awareness and inspire healthy actions. In addition, the national stroke strategy for England was coming to an end in 2017 and the government said it had no plans to renew it. It became imperative for the Stroke Association to develop a campaign that would also generate enough momentum and support to spur the government to re-evaluate and re-invest in the national stroke strategy. With these two important goals in mind, the Stroke Association couldn’t afford to have its PR programs go unmeasured. The charity needed to build their campaign based on tangible data and put in place a measurement system to ensure its effectiveness for the duration of the campaign. 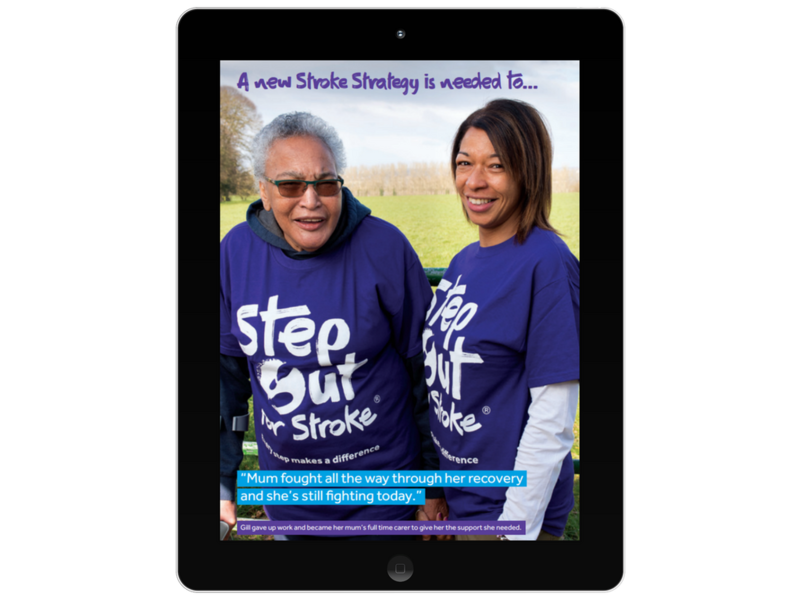 Four months before launching its campaign, the Stroke Association turned to Cision Insights to create and implement a research-based foundation against which the PR team could measure the impact of their activity. The Cision analysis aided in optimizing the PR outreach in mid-flight, and measured awareness of stroke among the general public. Cision Insights provides human analysis and reporting backed by our proprietary tools and leading content sources Cision Insights helps brand identify influence, craft campaigns and attribute value in a way that maps to a communications team’s workflow. Based on these objectives, the Cision team implemented the following program so that the Stroke Association would be able to precision-target its messaging, monitor and analyze campaign progress, and adjust strategy in real-time to optimize results. Cision used an omnibus survey developed with market research company, Opinion Matters. The survey of approximately 10,000 U.K. residents asked questions ranging from lifestyle preferences, attitudinal statements, charity support and media consumption habits. The survey was used to build nine specific target audience profiles. By querying the data on respondents’ media consumption, it was possible to identify a list of priority target media outlets for each profile. The Cision team assessed the tracked coverage generated by these target media outlets as the campaign was launched, together with the resulting reach to the individual target audiences. Survey insights were gathered twice: the first in June, after the launch of the campaign, and the second in January, at the end of the campaign. Weekly analysis ensured the PR team could track progress against KPIs through live online dashboards. Key metrics included spokesperson penetration, message delivery, calls to action and most prolific journalists. The PR team also tracked the most prominent publications, third party advocates and track sentiments. Along with tracking the use of the campaign hashtags and general social reach, Cision worked closely with the Stroke Association’s social media and digital teams, who provided data on the click-throughs to the website generated by social media content. This provided direct evidence of the impact of the social component of the campaign. Cision also tracked of a variety of key influencers – from celebrities to official health influencers. The latter is important as while the Stroke Association is good at gaining wide-reaching celebrity endorsement, in previous campaigns it had been less successful at identifying non-celebrity health influencers with strong social impact. Additional awareness surveys based on a representative sample of 1,000 U.K. adults were run with market research company Usurv before and after the campaign. Survey questions concentrated on the key messages and also the media platform from which they had heard the message. With a measurement program in place, the Stroke Association launched its campaign, A New Era for Stroke, designed to engage the public and attract media attention with a goal of securing signatures for a government petition during its stroke month, Make May Purple for Stroke. Campaign elements consisted of multiple coordinated efforts to drive people to an online petition that called on audiences to support the charity’s call on the Department of Health and NHS England to develop a new national stroke strategy for England. The campaign began on May 17, coinciding with the Stroke Association’s biggest fundraising initiative of the year: Make May Purple for Stroke. The end date was set for October 28, World Stroke Day. The final month of the campaign represented a crucial push to get the volume of signatures required to trigger a debate in Parliament — the ultimate campaign goal. “We wanted the government to address unacceptable variations in stroke care and treatment in different areas of England, drive progress and create advances in treatment, and improve overall support and standards of treatment for people affected by stroke,” said Ranchod. The first measurement survey, conducted shortly after campaign launch, indicated the petition had secured 5,000 signatures. Cision’s initial report highlighted that while the PR and social output correlated to a massive spike in signatures, these spikes would need to be higher in order to meet the Stroke Association’s goal of securing time with the Health Minister. Cision was able to show that although 48% of U.K. adults were reached by the New Era content and messaging, only 14% had been exposed to coverage featuring a link to the website to sign the petition. Following this feedback, the Stroke Association adjusted its activity and managed to increase the coverage featuring the website link which doubled its original results. 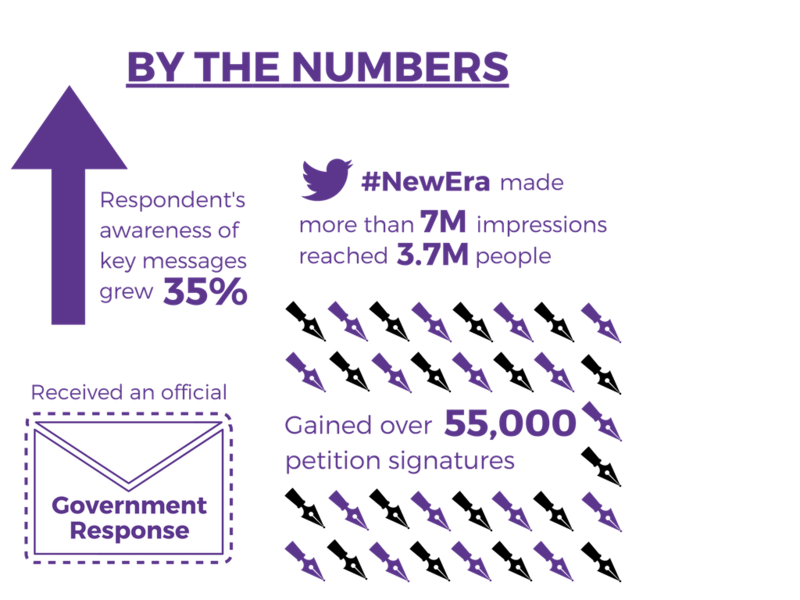 Further insights showed that the Stroke Association’s crucial New Era petition stories were battling for attention with the less specific Make May Purple fundraising stories. This was especially a problem within regional newspapers read by the charity’s target audience. The same pattern emerged on social platforms: #MakeMayPurple achieved four times as much traction as #NewEra. The initial insights report also highlighted the key fundraising influencers and so the Stroke Association could re-approach them with #NewEra-only content. “Having access to an in-depth analyses mid-way through the initiative allowed us to effectively pause, evaluate our work and make adjustment to our strategy accordingly,” said Ranchod. Buoyed by the introduction of case studies on social media and the subsequent seven million impressions made by the #NewEra hashtag, the petition link was shared almost 4,000 times, potentially reaching 3.7 million people. From the end of campaign survey, Cision reported that respondent’s awareness of the Stroke Association’s key messages grew 35 per cent compared to the initial report. Due to this strong growth, the charity’s PR team was able to demonstrate that the change in tactics had been key to achieving campaign goals. The Stroke Association gained over 55,000 signatures and received a Government response: the petition led to a government committee saying to health ministers their response was not good enough and challenging them on the need for a new strategy – this led to two meetings with a health minister. The charity launched a campaign to get the signatories of the petition to each write to their local MP, via an online letter generator, on the Stroke Association’s website. While progress has been made, changing Government policy, and a surprise General Election, is a long haul task and thanks to the evaluation of the previous stage, the Stroke Association is now equipped with the tools to generate change through its PR activities and localized activity. Since the general election, the charity has had to review its tactics and approaches but the goal remains the same.